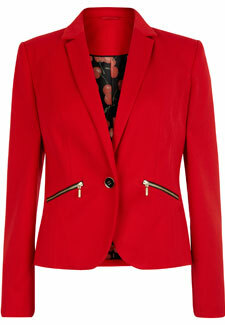 Q: I want to find a bright blazer to wear for work but don’t want to spend a fortune. It needs to look good with a dress or jeans. Where can I find one? A: This vibrant red number will instantly update any outfit. The zip detail is new for this season and the smat-casual cut will work carry you from day to night with ease. And, at just £26 it’s a bargain from Primark and comes in sizes 8-18. HAVE YOUR SAY! Have you got more advice to offer on this question? if so, make sure you add a comment int he box below. If you’ve got a question for one of our experts, you can also post that below as well.